Opening Day is almost here … though sadly (and not surprisingly), Ozzie Smith and Budweiser’s push to make it a holiday was denied. As a result, I had to take a vacation day for tomorrow to stay home and scout out the Cubs-Pirates and other early games before the Cardinals and Reds begin at 3 p.m.
It’s a relief to finally have the regular season arrive. All the countdowns and all the spring training games are finally over and it’s real baseball for the next six (and hopefully seven) months. 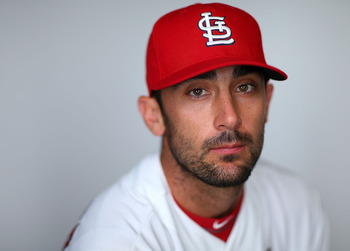 And there are five 2014 St. Louis Cardinals I’m looking forward to watching a little bit more once game time arrives tomorrow (or, in the case of a couple, when they take the pitcher’s mound). No surprise, right? Who isn’t looking forward to seeing Wacha (Wacha Wacha) pitch again when it counts, especially after how he did this spring when it didn’t matter at all? Perhaps those spring numbers are encouraging too, despite the fact they don’t mean anything. He just went out and continued to do what he did last September and October. Expectations are obviously high for him based on those performances, both from around the rest of MLB and even the Cardinals — the kid is starting the home opener after all. It will be fun to watch him out there again starting Wednesday night. How does a guy follow up a breakout .318/.392/.481 season when he plays a new position and finishes fourth in the National League MVP race? That’s what we will find out starting tomorrow afternoon. As we all know, he’ll be moving back to his natural position of third base this season — not that he had any trouble at all adapting to playing second base last year. Or batting lead-off, where he’ll be for at least the beginning of the season. How will he respond after last season’s success — and a poor spring? Should we be concerned? 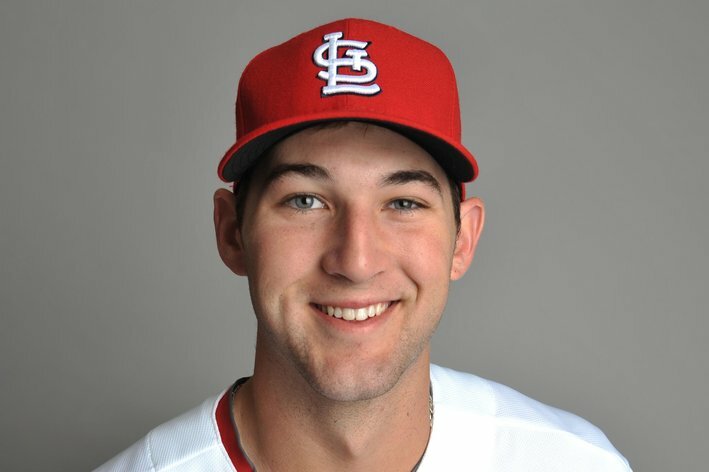 Should we remember yet again that spring stats don’t mean anything (even Michael Wacha’s)? Just some of the reasons why I’m anxious to see him out there. 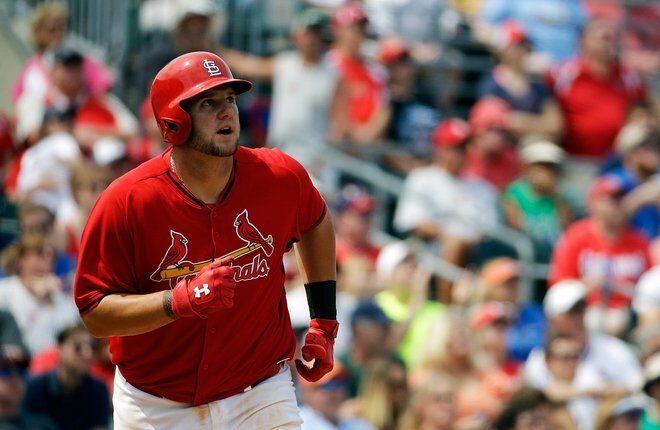 It was fun watching Matt Adams back in 2010 when he was on the Quad Cities River Bandits and one of those rare players who blasted a home run into the Mississippi River. In 2012, it was great to watch his big league debut and then have a chance to make an impact last season with more playing time. Now, with the opportunity to play full time, will he improve on 2013’s .284/.335/.503 and 17 homer performance? (Here’s hoping he can improve on those 80 strikeouts in 296 at-bats.) Let’s see how he’ll do — and anticipate there will be plenty more of those majestic homers too, just because they’ll always be fun to watch. 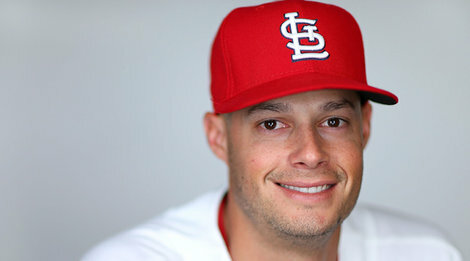 After back-to-back spring trainings being in a “battle” for the fifth starter spot, Joe Kelly begins 2014 as part of the starting rotation (which wasn’t really a surprise to me at all). So how will he respond? We know he was better as a starter than a reliever last season — he was 9-3 in 15 starts with a 2.28 ERA once he joined the rotation, compared to his 1-2 record and 3.68 ERA when he was in the bullpen — and that he’s been a bit better as a starter during his two seasons in the majors. Now that he’s in the rotation for Opening Day, will he continue that pattern? And, pitching duties aside, what kind of antics does Joe have planned for 2014? More dancing, more standoffs, more photo-bombs? The possibilities are endless. True, I’ve been far from shy about my feelings for the Cardinals new centerfielder. 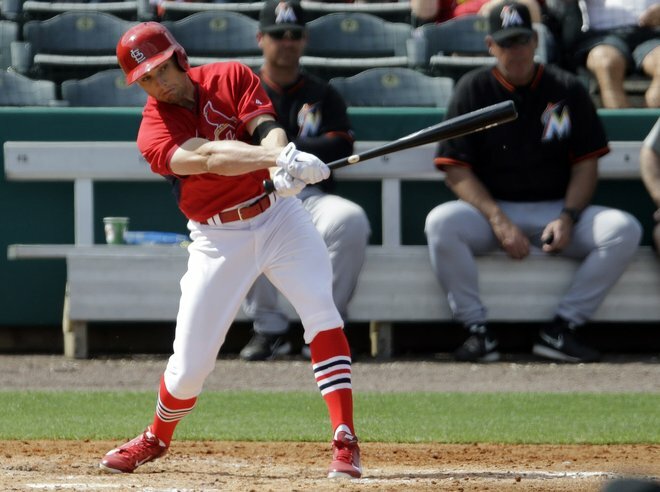 However, aside from seeing those high socks every day, I’m really looking forward to watching him out in the field — and all the more after reading “it’s not a stretch to say that Bourjos might be the closest thing Cardinals fans will ever see to a player fielding at an Ozzie Smith level in the outfield” from Ben Humphrey of Viva El Birdos. Plus Peter said he hopes to steal 40 bases this season. After a 2013 season in which the entire team stole 45 bases and Jon Jay was the team leader with 10, that can bring about a new dimension to the Cardinals that we haven’t seen in quite a few years. Of course, he needs to get on base in order to steal. So here’s hoping for that success first — along with plenty of entertainment on the bases once he does and in centerfield. This entry was posted in 2014 Cardinals and tagged 2014 season, Joe Kelly, Matt Adams, Matt Carpenter, Michael Wacha, Peter Bourjos by Christine Coleman. Bookmark the permalink.